Remove all weeds and loosen any heavily compacted areas. No need to remove rock. A light roto-tilling (1" deep) is the best bed preparation. Soil amendments and fertilizers are not needed other than a light application (5 pounds per 1,000 square feet) of 100% organic fertilizer. Apply the seed at the recommended rate, making sure to get good soil/seed contact, and lightly rake the seed into the soil. Spring-blooming wildflowers should be planted the previous summer as Mother Nature does. Apply supplemental watering in the fall and in the spring if the weather is unseasonably dry. If rains are normal, no watering is needed. It is best to plant wildflowers either on bare ground or in heavily scalped and aerated turf. This article was originally published in the May 2003 issue of The Dirt Doctor's Dirt Magazine. It's wildflower time in Texas. More than 5,000 species of flowering plants are native to Texas. Because Texas covers more than 267,000 square miles and sprawls across many different climate and soil regions, the plant diversity is wonderful. The wildflower season is at its height during the spring months, but many bloom during summer and fall. May in Texas is a great time for wildflowers. Here are a few of my favorite wildflowers that you may find blooming now throughout the state. Swamp Milkweed (Asclepias incarnata) This is a beautiful milkweed, or butterfly weed, with rosy pink flowers. The more common species, like A. tuberose, have orange to yellow blooms. Swamp Milkweed is also larger than the more commonly grown species. Plants can reach 3 to 4 feet in height. Some say the flowers smell like bubble gum. 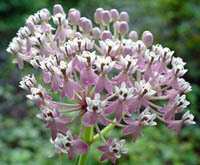 As its name implies, Swamp milkweed will grow in wet, even boggy soil. It will also grow in better drained soils. You'll find this beauty in full sun locations. The flowers are long lasting when cut. Milkweeds are the primary host plant for monarch butterflies. Button snakeroot (Eryngium yuccifolium) This is an unusual wildflower with unique blooms. The 1" thistle-like flower heads consist of small white flowers mingled with pointed green-blue bracts. The flowers resemble those of echinops. The plants have spiny-edged yucca-like leaves up to 2" long. This interesting plant is excellent in difficult soils and arid climates. It is native to prairies and is very drought tolerant. 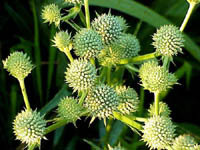 It is also called Rattlesnake master; this common name is derived from an old belief that the roots could be used to heal rattlesnake bites. Plants grow from 2 - 4 feet tall. Texas Thistle (Cirsium texanum) This impressive rose-pink thistle grows in all areas of the Texas except the Panhandle. 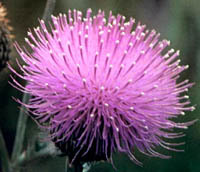 It is almost identical to the Scottish thistle. Texas thistle grows in a variety of soil conditions, and is very attractive to wildlife. Goldfinches eat the seeds of this plant and use the silky fluff of the mature seeds to line their nests. The flower buds are occasionally eaten by white-tailed deer and the seeds are eaten by Rio Grande turkeys. Bumblebees pollinate the flowers, which appear from April through summer. This is an upright perennial that can grow two to five feet tall, with spiny leaves. Yellow Flax (Linum sulcatum) Yellow flax, or grooved flax, is a delicate looking annual that actually spreads somewhat aggressively. The plant is similar to common domestic flax in general appearance, except the flower petals are pale yellow. The buttery-yellow flowers bloom in the morning, but may expire by the end of the day. 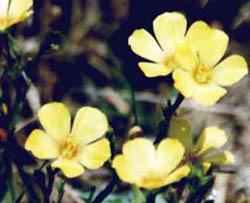 Yellow flax is commonly found in dry native prairie areas. Purple-headed Sneezeweed (Helenium flexuosum) Purple-headed sneezeweed was originally a southern species but is migrating northwards. Flowers have a dark brown cone (or disk) sometimes with a purple hue, surrounded by bright yellow rays. It's a great plant to grow in difficult wet areas of the garden. 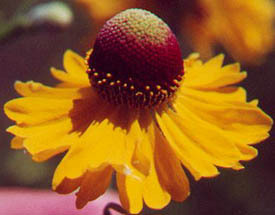 Sneezeweed's native habitat is typically damp meadows and thickets. This species contains compounds that are poisonous to many grazing animals, but these compounds also have anti-cancer properties. 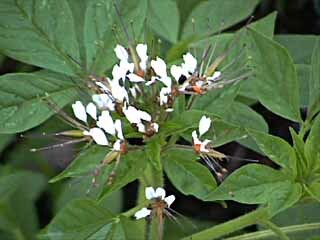 Clammy Weed (Polanisia Uniglandulosa) Clammy weed is a cleome-like flower with clusters of white to purple flowers.The plants are sticky, hairy, and produce a strong scent. This species really does resemble a cleome, and is often confused with them. In fact, the plants were originally classified as a cleome species, but later renamed. Clammy weed is in the caper family; capers are the flower buds of a related species and are similarly pungent. Plants usually reach about a foot tall, but can reach 3-feet. Fruits consist of slender capsules about one or two inches long that are filled with many tiny, dark seeds. Standing Cypress(Ipomopsis rubra) While the genus of this species would lead one to believe that this is a type of morning glory, it is actually a phlox. 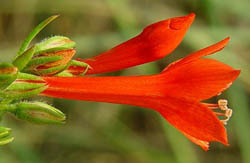 It is sometimes also known as Scarlet Gilia. This striking beauty is a biennial which produces a large rosette of cypress-like leaves the first year and a stout, erect flower stalk the second year. The blooms are a brilliant scarlet. Flowers are trumpet shaped and appear in en masse. Hummingbirds are the primary pollinators of standing cypress. Long-tongued moths are also attracted to the flowers. Plants bloom through the summer. Partridge Pea (Cassia fasciculata) This member of the pea family might be a little difficult to spot, as it commonly grows in the underbrush in fields and at the edge of wooded areas. It is a colorful plant with attractive bright yellow and red flowers. The compound leaves resemble those of a sensitive plant. The leaves are slight sensitive to touch, and may close up if handled. The fruits are pea pods, filled with peas. Plants grow to 1- to 2- feet tall and bloom mid- to late-summer. This is one of the few Cassia species that is not woody, but rather an herbaceous annual. 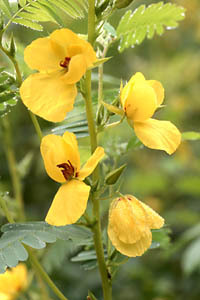 Partridge pea is a host plant for many butterfly and moth species. Four point evening primrose (Oenothera rhombipetala) This primrose is really stunning. 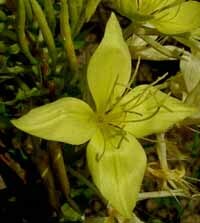 Its bright yellow blooms, which can be up to 3" in diameter, really put on a show. Each petal is diamond, or rhomboid-shaped. Several blooms open at once on each stem, and there are several stems per plant. Plants are typically found in sandy soils in sunny fields. You may even find it in dappled shade at the edge of wooded areas. Cultivating this beauty in your garden requires well-drained soil. Pink evening primrose (Oenothera speciosa) This is a very common wildflower in the prairie lands of Texas, but it is still one of my favorites. 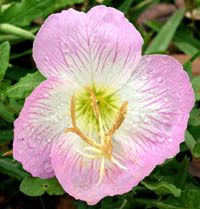 The pink evening primrose has a white to pink flower with pink or red veins. Pink evening primrose is a tough, adaptable ground cover that spreads quickly. If you don't start mowing your lawn too early in the spring, you may find yourself with a nice stand in a sunny yard. They open daily from spring through summer with a delicate scent. Contrary to their name, the flowers are open during the daytime. Plants are very drought tolerant. Q: I live on a five acre tract at Lake Whitney in Hill County. My meadow has a fair amount of wildflower cover each year. The property has never had chemical fertilizers or non-native plants introduced. I received 1/2 lb of native Texas wildflower mix seed for Christmas. My plan is to scratch some bare soil areas (I added some fill dirt in some holes around the meadow) with a rock rake and plant the seed. Since I missed the best fall planting window, when would be the best time to plant? - J.S., Hill Co.
A: It depends on what varieties you have. Spring bloomers like bluebonnets and Indian paintbrush are best planted in the summer. The summer bloomers like coreopsis and rudbeckia are best planted fall through late winter. If yours is a mix, you might want to go ahead and plant them now. They were a gift, might as well give it a shot. Developed by natural farmer Masanobu Fukuoka in Japan, seed balls allow you to quickly seed large waste areas of your yard, or any area with thin, dry and compact soil. Since the seeds are encased in a mixture of clay and compost, they're protected from birds and animals, they won't blow away and they won't dry out in the sun. Measure three parts dry compost and five parts dry powdered terracotta clay into a large mixing bowl. The compost will provide valuable nutrients for the seeds as they begin to sprout and the clay, once wet, will hold the balls together. Mix together the seeds you'd like to plant to make one part seed mixture. Choose varieties that are drought resistant in your area and that work well together as companion plants. Consider mixing edible herb and flower seeds, wildflower seeds, or seeds to attract beneficial wildlife to your garden. Mix one part seed mixture into the combined clay and compost. Gradually add one to two parts water until the mixture is moist enough to work into balls but not wet. Roll the mixture into 1- to 2-inch balls between the palms of your hands. Line a cookie sheet with parchment paper, and place the balls on the sheet spaced so they don't touch. Allow the clay balls to dry on the cookie sheet for several days. Store the dried seed balls in a cool, dry location or scatter them directly on the surface of the soil. As moisture from rain and watering seeps into the clay, the seeds will start to germinate and the balls will incorporate into the surrounding soil. For best results, scatter your seed balls just before a rainy spell in early spring to promote quick germination. Avoid using large seeds as they can cause the balls to crack when drying.